Are you facing difficulties while computerizing office employee stations? Do you need a faster and less expensive way of equipping computer workstations for your employees? 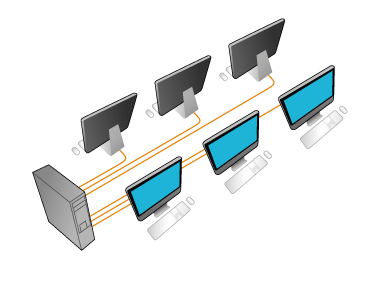 Then it makes great sense to use two monitors on one computer allowing several users to work independently and simultaneously. IBIK company is ready to offer you innovative ASTER software allowing you to share a computer system and use one computer for many users on the basis of available equipment without spending a fortune. In fact, ASTER is an inexpensive, convenient and highly efficient solution for using two monitors on one computer in office units, banks, post offices and other departments. With ASTER you can take advantage of the capacities of existing computers and share a computer system to provide your office employees with independent computerized workplaces. More importantly, when running one computer for many users, you can save electric power and use office space efficiently. ASTER is a perfect alternative to expensive thin clients, which are not always convenient to use. To have one computer for many users you just need additional keyboards, mouses and monitors depending on a number of workstations you need to equip. Moreover, when you use two monitors on one computer (or even more) with ASTER, you may rest assured that several users can use common resources while doing different tasks at the same time without any hassles. Actually, when you share a computer system to computerize your office, you create a low-cost, high performance and environmentally friendly alternative to traditional computer equipment. If you are going to use two monitors on one computer and have several users working on a single computer system simultaneously, take advantage of our powerful ASTER shared computer access software solution.